A ring of children sit in a circle around David Coppley, each with a bicycle wheel balanced in their lap. Coppley, Intercity Transit’s Earn-A-Bike instructor, demonstrates the process of letting the air out and carefully removing the flat tire from the rim. Each child follows along with the instructions studiously, before beginning the process of letting the air out of their own tire. The fix-a-flat class is about to be more common in this large garage space, now that Intercity Transit’s Walk N Roll Youth Education Center has officially opened in downtown. 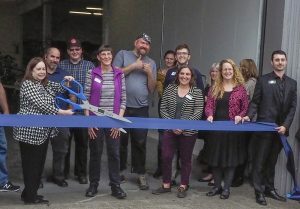 On April 4, dozens of community members including business leaders, Intercity Transit staff, volunteers, children with their parents, and other community members, came together to celebrate the opening of the center located on Washington Street, perfectly positioned just across the street from the Olympia Transit Center. 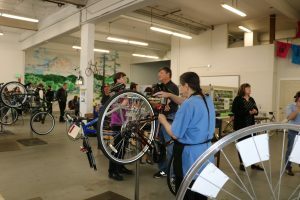 At the open house, the public was able to get their first look at how the space will operate to allow volunteers and youth to utilize 10 work stations to repair donated bikes for youth in the community. “The Walk N Roll Program and the new Youth Education Center shows the commitment of Intercity Transit to all kinds of transportation, especially healthy transportation,” says Karen Messmer, citizen representative for the Intercity Transit Authority. Not only does the center have garage space for fixing and maintaining bicycles, but it also has room for storage, as well as office space for program staff, including two spaces for AmeriCorps members. The space brings together activities that were originally split up among several buildings and storage facilities. This will allow staff, volunteers, and youth to collaborate, work, and learn, with the goal of encouraging healthy and safe transportation around Thurston county, explains Rena Shawver, marketing, communications and outreach manager for Intercity Transit. Pete Kmet, mayor of Tumwater, came for the ribbon cutting. Kmet has been very supportive of Intercity Transit’s Walk N Roll to School Days, participating in many of the Tumwater events. “I try to get out to every Walk to School event that happens at Tumwater elementary schools,” he says. Debbie Sullivan, chair of Intercity Transit’s Authority Board, cut the ribbon after speaking about the importance of the youth education center. “It turned out even better than we anticipated,” she said, gesturing to the bike maintenance work stations. 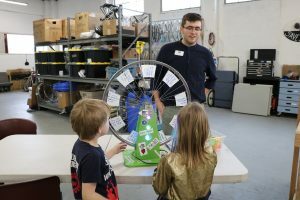 In addition to the ribbon cutting and fix-a-flat hands-on demonstration classes, the open house gave attendees an opportunity to take a look at the space, play bicycle safety trivia, and learn about many of the programs available through Walk N Roll. Hilary Seidel, member of the Olympia School Board, also attended the grand opening. Seidel brought her three kids along to check out the new center. “I think it’s important to teach transit literacy and get kids of all ages involved in the different parts of transit: walking, bike riding and taking the bus, to help teach them independence,” she says. The new education center will make it easier for staff and volunteers of Intercity Transit to coordinate outreach classes with the youth of Thurston county as well as provide the perfect setting for in house classes that Intercity Transit offers. Intercity Transit provides programs to students of all ages, throughout Lacey, Olympia, Tumwater and Yelm. Walk N Roll to School Days are an opportunity for elementary students to learn safe practices and walking routes in their neighborhood. On designated days, a group of school staff, parents and kids meet up at a prearranged location and walk to school together. Oftentimes the local police department, fire department and representatives of other agencies will show up to walk with the kids, says Shawver. Walk ‘N’ Roll to School Days currently take place in 12 area schools. Earn-A-Bike is for middle schoolers. Every year a different school is chosen to take part in Earn-A-Bike classes. Students that participate learn safety and rules of the road, as well as practicing basic bike maintenance, like fixing a flat tire and taking care of their bike chain. Classes take place over 8 weeks, and about 80-100 kids participate every year. The new Walk N Roll Youth Center will accommodate summer Earn-A-Bike classes, which are available through Olympia Parks and Recreation. 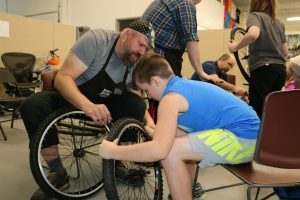 Bike MVP is a new program involving high school students, where they can learn more in-depth bike mechanic skills and give back with 20 hours of community service as a bicycle mechanic for the Earn-A-Bike program. Bike MVP is available for 12 high school students, and is a great opportunity for high schoolers to work on their community service hours for graduation while learning new skills. You can support the work of the Walk N Roll program by volunteering in our shop, with our classes, or by donating bikes and bike parts. For more information about Walk N Roll Youth Programs, check out the Intercity Transit website. 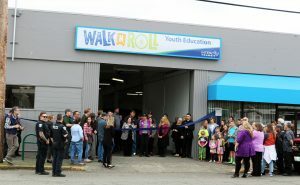 The Walk ‘N’ Roll Youth Education Center is located at 215 Washington St NE in Olympia.